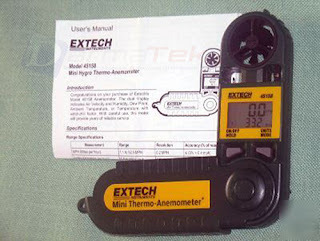 The Extech 45158 Mini Thermo-Anemometer Berkualitas. Simultaneously display Air Velocity and Temperature or Wind-chill on the LCD screen. Selectable averaging function of 5, 10, or 13 second intervals. Fold up protective housing extends to 9 in. (229mm) for a better reach. Tripod mountable. Features Data Hold with Auto power off functions. Complete with battery and 43 in. lanyard. Sell Extech 45158 Mini Thermo-Anemometer Berkualitas at economical prices and look for other products from the Anemometer category of Extech Brands. Free shipping for the Jakarta area and can be sent throughout Indonesia. Get only at Darmatek online store, online shopping is easy and safe.